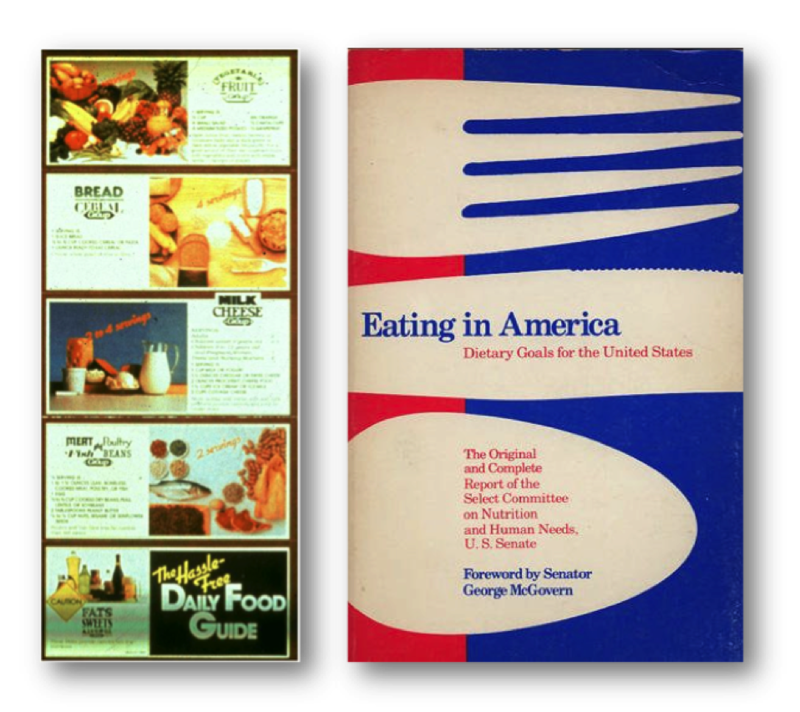 To make the history of American nutrition education more palatable, I’m telling the tale of the United States’ food guidelines since the 1890s through the lens of one of my most favorite foods: butter, which I have blogged about before. Research on saturated fat (contested by some, and some others) has maligned butter, but this spreadable deliciousness was once enthusiastically endorsed by nutritionists as a good source of calories and vitamin A. For the better half of the twentieth century, calories were not something to be counted, limited, or feared. Rather, to address nutrient deficiency diseases and inadequate diets, food guides recommended robust consumption—including plenty of butter. Increased food availability, changing disease patterns, and additional research findings have all shaped nutrition education since then, but just for the fun of it, let’s make this creamy spread our buttery Virgil through the history of food guides. Wilbur O. Atwater published the first government food guidance in 1894 in the Farmer’s Bulletin, laying the foundation for nutrition science as we know it (for better or worse), including macronutrients and the notion of calories. Building upon Atwater’s findings, nutritionist Caroline Hunt published the first USDA food guide, Food for Young Children, in 1916, which instructed mothers on what and how to feed children ages three to six. Of five food groups, one is dedicated to butter, another to sweets. (I know! Right?) With Atwater’s daughter, Helen Woodard Atwater, Hunt published How to Select Foods in 1917, which presented the content of the children’s guide to a more general audience. Butter for everyone! Hazel Stiebeling’s Food Budgets for Nutrition and Production Programs (1933) sought to meet dietary needs during the Depression. During the Depression, USDA head food economist, Hazel Stiebeling, published Food Budgets for Nutrition and Production Programs, which included nutritionally adequate food plans at four different budget levels. While the recommended amounts of cereal, milk, and meat were greatly reduced in the most restricted diets, fats (including our beloved butter) remained relatively constant. Butter lives on! During World War II, nutrition guides played a role in the war effort, as the government sought to nourish healthy soldiers and citizens. These recommendations were communicated to the public as the “Basic Seven,” which might be my favorite guide of all since it figuratively depicts a food group dedicated to butter. It’s bright yellow, no less. Butter triumphs! In 1958, Food for Fitness–A Daily Food Guide, popularly known as the “Basic Four,” replaced the “Basic Seven” and would remain in circulation for nearly twenty years. Like the Basic Seven, it was a “foundation diet,” recommending a certain number of servings from four groups, while allowing for additional foods, like, ahem, butter. The Senate Select Committee on Nutrition and Human Needs published the first nutrient-based guidelines in 1977, summarizing them for the public in the The Hassle-Free Daily Food Guide in 1979. The guide retained the four food groups of the “Basic Four,” but added a food group to avoid (fats, sweets, alcohol), demarcated by a yellow caution sign. Butter’s demise begins. Continuing on the nutrient-based path set by the Dietary Goals, a USDA committee, made up of nutrition experts from within and outside of government, released the first Dietary Guidelines for Americans in 1980, which are reviewed and revised every five years. Recommendations to avoid saturated fat serve as another nail in butter’s coffin. 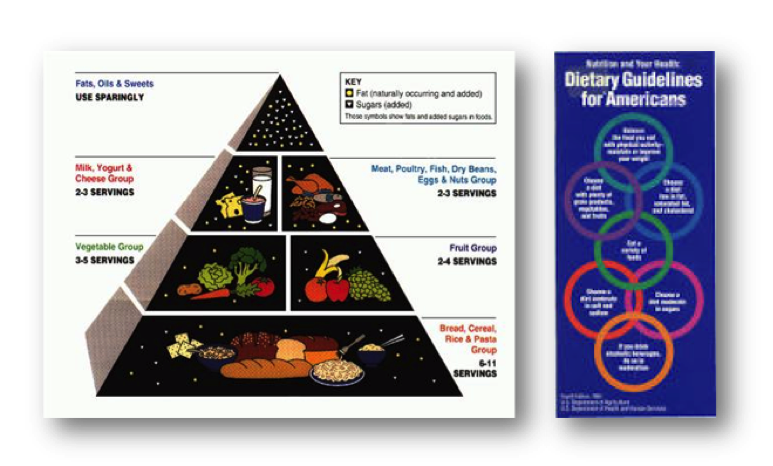 Concerned that the American public was not aware of the Dietary Guidelines, the USDA developed and heavily promoted the Food Guide Pyramid in 1992, which played heavily in my own nutrition education in elementary school. Marion Nestle’s Food Politics: How the Food Industry Influences Nutrition and Health reveals the ways that the food industry and food lobbies influenced how the tool came about and continues to shape the Dietary Guidelines (her blog is often pretty fab too). As for butter, it is now a mere sparkly dot in the pyramid’s peak, to be used sparingly. The MyPyramid Food Guidance System (quite the mouthful, huh?) replaced the food guide pyramid in 2005, but its conceptual design—vague, confusing, and devoid of food—failed to catch on. The Harvard School of Public Health was so disappointed in both pyramid designs and the Dietary Guidelines behind them that they issued their own Healthy Eating Pyramid, which they argue better represents current scientific research on the connections between diet and health. Whether following the USDA guidelines or Harvard’s, butter is to be used only sparingly, contained within MyPyramid’s skinny yellow strip and the Healthy Eating Pyramid’s top section. 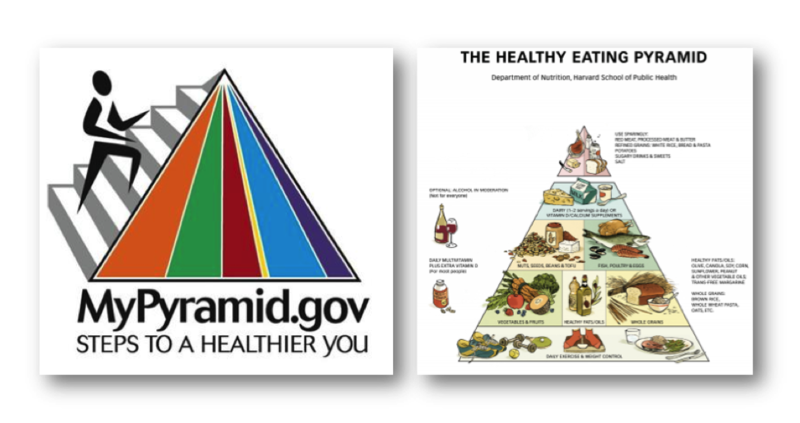 In 2011, the USDA did away with the pyramid altogether, opting for a dinner plate design that had been used previously in diabetes education and as “the eatwell plate” nutrition education tool in the UK. Harvard again presented their own version. No matter how you slice it, they all limit butter. The 2015 Dietary Guidelines will be released this fall. Despite the number of folks putting butter in their coffee, butter likely won’t be making a creamy comeback, but it will be interesting nonetheless to see if and how federal dietary guidance evolves. Despite, or perhaps because of, the many challenges to and critiques of the dietary guidelines, they stand out as seminal artifacts of socialized nutrition knowledge, allowing us to witness scientific paradigms in the making and as they transform. The content of food guidelines and their accompanying images are most intriguing when analyzed in context. They tell us something meaningful about how governments, experts, the food industry, and citizens conceptualize food, diet, health, and disease at a particular point in time.